A sculpture of Ronald McDonald nailed to a cross — a spoof of the crucifixion of Jesus — has sparked violent protests in Israel, with rioters hurling a firebomb at the museum. 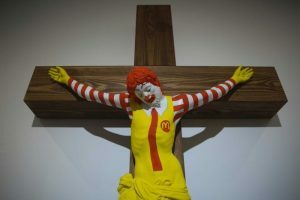 Hundreds of Christians calling for the removal of the sculpture, entitled “McJesus,” demonstrated at the museum in the northern city of Haifa last week. Israeli police say rioters hurled a firebomb at the museum and threw stones that wounded three police officers. Authorities dispersed the crowds with tear gas and stun grenades. 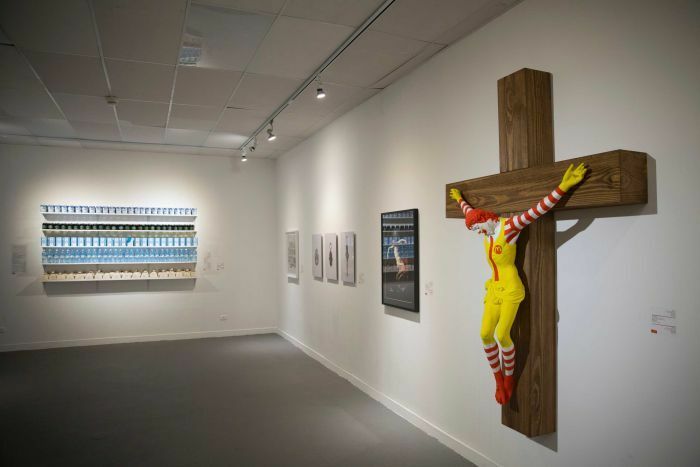 Church representatives brought their grievances to the district court on Monday (local time), demanding it order the removal of the exhibit’s most offensive items, including Barbie doll renditions of a bloodied Jesus and the Virgin Mary. Museum director Nissim Tal said that he was shocked at the sudden uproar, especially because the exhibit — intended to criticise what many view as society’s cult-like worship of capitalism — had been on display for months. The museum has so far refused to remove the exhibit, saying that doing so would infringe on freedom of expression. But following the protests it hung a curtain over the entrance to the exhibit and posted a sign saying the art was not intended to offend. “This is the maximum that we can do,” Mr Tal said. The concession has done little to placate those who want the artwork removed. Mr Leinonen said he supported Boycott, Divestment, Sanctions, or BDS, a Palestinian-led movement aimed at pressuring Israel to change its policies toward the Palestinians. The group has made significant gains in recent years, persuading a number of foreign artists to cancel performances in Israel. However, Mr Tal said the museum would not bow to religious or political pressure.